This page is valid for SysCAD 9.3. For SysCAD 9.2, please see Species Table 9.2 - Phase Change. The Phase Change field is optional. All of the other fields in this section will remain grayed out until the user selects a Phase Change Type. Once a Type is chosen, the Paired and Function fields may be entered. There are 3 types of Phase Change - Solubility, Temperature and Mass Fraction. This will be described below. Only a single Phase Change Type may be defined for each species. The solubility of the solute changes as a function of temperature in Kelvin. The user may enter data for the Solubility function, or use Hard-wired data if it is available. All liquid species will have the 'Phase Change' field. The user may double click on the button to the right of the field to see the dialog box required to enter user Solubility data. 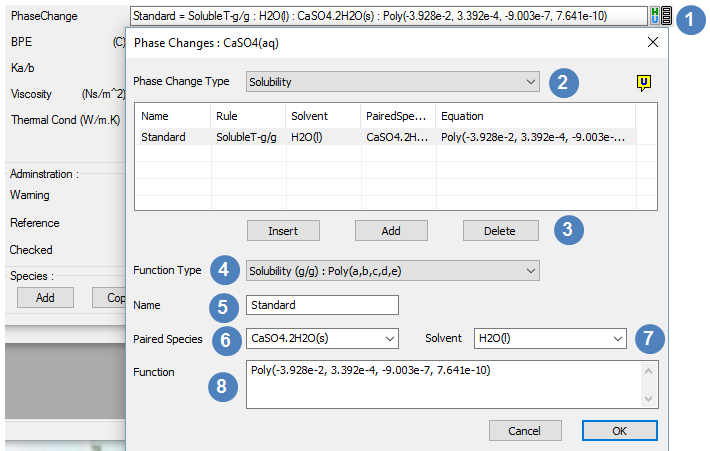 Select 'Solubility' from the Phase Change Type drop down list. Click on to add the first, or a subsequent, Solubility curve. Click on to delete a Solubility curve. Click on to insert a curve before an existing curve in the list. Enter a name for the solubility curve, or accept the default name. This is important when the user enters 2 or more solubility curves. An hydrated form of the component, for example CaSO4(aq) <=> CaSO4.2H2O(s). Select a Solvent species from the drop down list. (In most cases this will be water, H2O(l)). Finally, enter the required function. Please note that all methods MUST use temperature in Kelvin. If the user has selected a TSpline or Table function, they may enter the values manually or copy them in from an external package, such as Excel. Please see Entering Spline Data in the Species Database. The user may select solubility as either g/100g solvent or g/g solvent. The user may enter a constant value for solubility, by selecting 'Value'. In this case the solubility of the species will not change as a function of temperature. Temperature MUST be in Kelvin. The user does not need to have all the constants, any that are not required may be set to zero. So, for example if you have a 3rd order equation, you would only need to enter a, b, c and d.
And enter the data in 2 columns. SysCAD will interpolate the data using the TSpline method. The easiest way to enter the data is to copy the data from a spreadsheet. (Please see Entering Spline Data in the Species Database). Note: A fitted equation will be processed more quickly within SysCAD and hence is preferred to entering a table of data. Curves may use different paired species. In this case the curves will be displayed as separate lists on the solubility page in SysCAD. In this case the user has entered 1 curve using Na2SO4(s), 1 curve using Na2SO4.10H2O(s) and 2 curves using Na2SO4.7H2O(s). The curves using the different solid paired species are shown separately. The user may select the required curve from the drop-down list for each species pair. If there is more than one curve available then when using solubility on a PC page for a unit operation the user can select which curve to use (and therefore use different curves for different conditions or process areas). If the user enables more than one curve for an aqueous species, only possible if there is more than one paired species, then SysCAD will calculate the aqueous solubility from the curve with the lowest solubility value at the operating temperature. When using Global solubility then the curve to be used is selected on the Soluble page of PlantModel. If there is a icon to the right of the Phase Change field, then a hard-wired data is available for the species. If the user clicks on they will see the data that is available. Please note that the user may only select a Single hard-wired curve. Perry, which is a polynomial. SysCAD will then calculate the maximum mass fraction of the aqueous species for each individual solute based on the stream temperature. The user may view the saturated values for species with solubility functions on the Species Properties ($SDB) access window. This solubility function is independent of pressure. Therefore, while the user may use this functionality to model the solubility of gas species in a solvent, this will not allow the user to include the pressure contribution. The associated enthalpy change with the change in the composition between the aqueous and other phases may result in a change in temperature of the stream. The user may enable the solubility function Globally in the model (see Plant Model - Soluble Tab). SysCAD will automatically adjust the mass fractions of the solute in the aqueous and the other specified phase, either solid or gas, in order to ensure that the maximum mass fraction of the aqueous species is not exceeded throughout the whole project. The user may enable the solubility function in individual units, if it is NOT globally enabled. This is specified by ticking Solubility.On in the Evaluation Block (EB). SysCAD will adjust the mass fractions of the solute in the aqueous and the other specified phase, either solid or gas, in order to ensure that the maximum mass fraction of the aqueous species is not exceeded in the specified unit only. If the specified mass fraction of the aqueous species is greater than 35% (relative to the solvent), SysCAD will adjust the mass fraction of the aqueous species down to 35% and transfer the excess to the other phase of the same species. If the specified mass fraction of the species in the aqueous phase is less than 35% (relative to the solvent) and there is some mass in the other phase then SysCAD will adjust the mass fraction of the aqueous phase up to 35% and the excess will remain in the other phase. The changes described above will happen automatically in a feeder (if solubility has been switched on) without adjusting the temperature of the stream. For an overview of Solubility features, see Solubility. Solubility Project - single aqueous species with multiple solubility curves. The phase will change at a specified temperature. For example, change from one solid phase to another solid phase. For this option, the phase change type selected must be PhaseChange at Temperature. This option is saved as 'Temperature' in the database. Note: It is expected that the change in enthalpy at the specified temperature from the selected species to the paired species will be positive (i.e. endothermic). Any phase changes which are defined for exothermic phase changes will be disabled on loading of a project. The paired species is the species that the selected species will change to at the specified temperature. The paired species must be the same component (i.e. contain the exactly the same number of each element). The paired species is chosen from the drop down list of available species. For example, if defining the change of CuSO4(A) to CuSO4(B) at a specific temperature, then the paired species of CuSO4(A) is CuSO4(B). Specify the temperature (in Kelvin) at which the phase change occurs. This temperature will be the maximum temperature at which the specified species will exist. If enough energy is added to change some of the selected species to the paired species, but not enough energy to change all of it, then there will be a mixture of both species at the specified temperature. At any temperature higher than the one specified, all of the specified species will change to the paired species (i.e. change phase). It is recommended that species in the same project never have the same phase change temperature. This is because SysCAD may change one species prior to the other at the specified temperature when a complete phase change of both species is not possible due to energy limitations. The user may enable the Phase Change @ T function Globally in the model (see Plant Model - Species tab page). SysCAD will automatically change the species as required throughout the whole project. The user may enable the Phase Change @ T function in individual units, if it is NOT globally enabled. This is specified by ticking PhaseChange@T.On in the Evaluation Block (EB). It is recommended to not use the Global option, and rather manage where Phase Change @ T occurs in individual units. The phase changes at a defined mass fraction in the specified solvent. For example, the change of H2SO4(l) to H2SO4(aq) in H2O(l). For this option, the phase change type selected must be PhaseChange at MassFraction. This option is saved as 'MassFraction' in the database. Note that both paired species must be in the same phase, i.e. solid, liquid or gas, but have different Individual phases. Also only one of the phases will exist in a stream or unit, the 2 phases CANNOT both occur together. For example, if the user specifies a Mass Fraction change at 0.983 for H2SO4(aq), then SysCAD will convert ALL of the aqueous form to the liquid form at a mass fraction equal to or above 98.3%. The paired species is the species that the selected species will change to at the specified mass fraction in the solvent. The paired species must be the same component (i.e. contain the exactly the same number of each element) in the same phase. The paired species is chosen from the drop down list of available species. For example, if defining the change of H2SO4(aq) to H2SO4(l) at a mass fraction of 0.983, then the paired species for H2SO4(aq) is H2SO4(l). Note Both species in this case must be of the same phase, usually Liquid. Specify the mass fraction at which the phase change occurs. This will be the maximum mass fraction (relative to the specified solvent) at which the specified species will exist. At any mass fraction higher than the one specified, ALL of the specified species will change to the paired species (i.e. change phase). The user may enable the Phase Change @ MF function Globally in the model (see Plant Model - Species tab page). SysCAD will automatically change the species as required throughout the whole project. The user may NOT enable the Phase Change @ MF function in individual units. It is either on or off globally. This page was last edited on 5 December 2018, at 23:57.